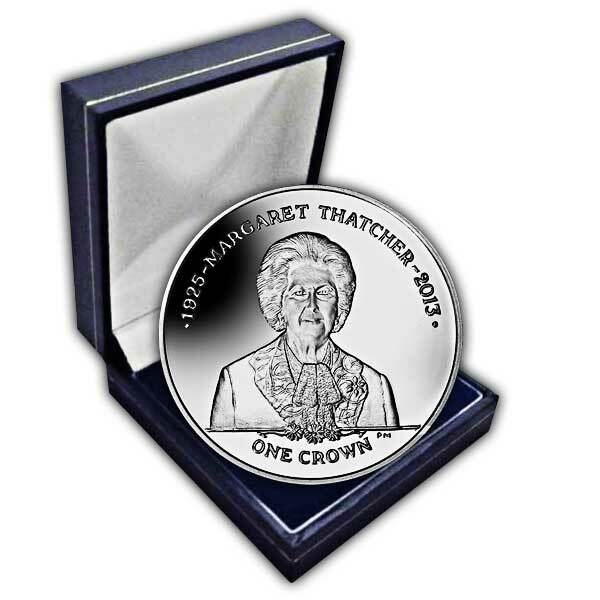 The 2013 Prime Minister Baroness Margaret Thatcher 1925 - 2013 Coin in Proof Silver. On 8th April 2013, Ex-British Prime Minister, Baroness Thatcher died at the age of eighty seven. To commemorate the life of this remarkable woman, Pobjoy Mint has released a stunning coin in behalf of the Falkland Islands. Called the Iron Lady, Margaret Thatcher came to be Britain's very first and to date only female Prime Minister and also the longest serving of the 20th Century and was honoured with a ceremonial funeral with full military honours at St Paul's Cathedral, the only politician to be provided such a memorial since the death of Winston Churchill in 1965. Born in 1925, the daughter of a grocer, she studied chemistry, yet was associated with politics from an early age. She was elected leader of the Conservative Party in 1975 and made history four years later, becoming Prime Minister when the Conservatives succeeded the elections of 1979, the first of three success under her management. As Prime Minister she took a firm position with the European Community as well as on other problems, both domestic and foreign and therefore transformed the nation. The 2013 Prime Minister Baroness Margaret Thatcher 1925 - 2013 Coin is a great memorial to a fantastic woman that, as described by the present British Prime Minister was "a great leader, a great Prime Minister, and a great Briton". The obverse of the coin holds an effigy of Her Majesty Queen Elizabeth II by Ian Rank-Broadley FRBS. The coins are offered in Cupro Nickel, Proof Sterling Silver and Proof Fine 999.9 Gold. The coins have been struck to the highest quality with the precious metal variations being produced with a sensational 'proof' finish.